Apple Watch Series 4 battery life: will it last more than a day? The Apple Watch Series 4 has a bigger, more immersive screen and it's much faster watch than before, but what about its battery life? Apple officially says that the Apple Watch Series 4 lasts an average of some 18 hours, so does that mean that in real life it won't be able to get you through a longer day? There is no way to test better than to use the watch and that's what we've been doing lately, and here is what you need to know about the battery life on the Series 4: yes, it will last you through even those longer days, and sure enough, it over-achieves and lasts a lot more than Apple officially says it will. In our experience with the watch, it lasted an average of 36 hours to 48 hours off the charger, meaning that for a lot of people, it will not be a big deal if you don't charge your watch every single night. You'd still get through the next day. 8:45am: I was out on a walk to take some photos with a few phones, so I score a half an hour outdoor walk workout and was home by 9:30am. From then on, it was a short drive to the office where I sit down in front of a computer. I got prompted to stand up twice, which is always a nice reminder, and I was getting pinged with various notifications and messages from social networks. I went out for lunch at noon. Noon: 91% battery level. After lunch, there's still plenty of juice left. So far, so good. 2:30pm: 85% battery level. An hour and a half, a few notifications and a 1-minute breathe session later. 5pm: 76% battery level. A couple of meetings at work and a lot of time spent typing on a computer, and it’s almost time to call it a day at the office. 9:30pm: 65% battery level. I drove for about half an hour back from work, had dinner and a workout in the schedule. 11pm: 57% battery level. A couple more hours at home and I was ready to hit the bed at around 11pm. Summing it all up, in a moderately active day for me, the Apple Watch Series 4 finished the day at 57% (meaning that it only used 43% of the charge). 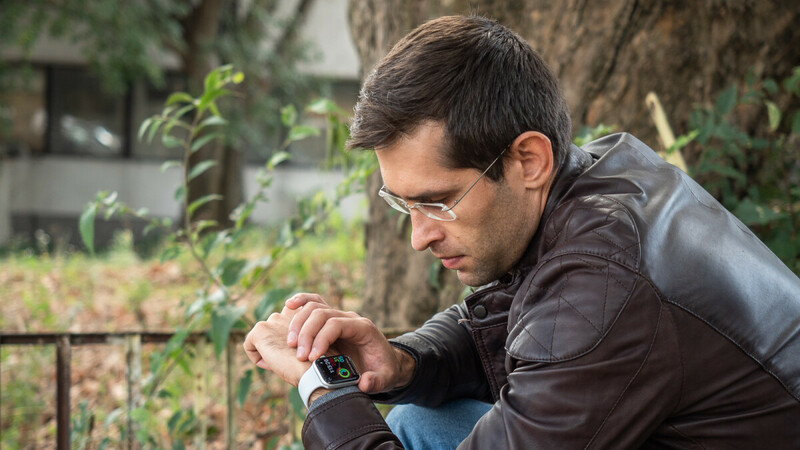 Considering that the watch uses very little juice when you put it on your nightstand, it will likely be able to make it through the next day if I keep the same level of activity. And that's not bad at all, don't you think? The Series 4 might not be the smartwatch with the longest battery life (not by any stretch of the imagination), but considering the powerful chip inside it, the big and beautiful display and the precise tracking that it does, it might well be worth trying it our to see if it fits your routine. Yea. Another useless device to charge on daily base. Congratulations. All smart watches are useless. Not just Apple. Fitness tracker is one, but smartwatch is stupid. if you have a smartphone, a smartwatch is just pointless, here is a smaller screen so i can check the bigger screen thats in my pocket without taking it out of my pocket. Thought they useless but really like owning one. Upgraded to the series 4. Just top my off every night. For most people it won't last 2 full days, which means charging every day. The gear lasts 4 full days, 96 hours. I remember having to charge my gear 2 neo everyday 4 years ago. Modern gears are multiple day with no worries. It was painful back then but Apple will one day focus on battery life and improve it. I went from the series 3 cellular 42mm to the series 4 cellular 44mm and have noticed a decent drop in longevity. My series 3 with all features turned on lasted 2.5 - 3 days and my series 4 with most apps uninstalled and background app refresh turned off is averaging 1.3 - 1.6 days. It gets me through the day regardless, however I find myself charging at night way more often stopping me from being able to sleep track. 3 to 5 days on my smartwatch, depending on usage (respectively heavy to mild). A day and a half sounds like progress... In the wrong direction. Super dope watch. I love rocking it. I owned a Galaxy Watch, sold it cause the first update bricked the battery life, and it suffered horrible lag. It didn’t last multiple days of battery life dude. C’mon bruh, don’t be a liar like midan.